Healthy Chocolate Truffles: Make Them Yourself At Home! Wouldn’t you love to eat a decadent truffle that’s actually not bad for you? Dieting can be really tough, and even if you aren’t sticking to a specific diet, it can be hard to find snacks that work well when you’re watching what you eat. Chocolate truffles might seem like they’re far away from what you can eat, but in reality, there are plenty of ways to make them healthy! Never heard of a healthy chocolate truffle before? Don’t worry! This article is here to teach you all about what makes a chocolate truffle healthy, as well as the pros and cons between traditional and healthier truffles. You’ll also learn a few tips and tricks to help improve the healthy quality of your batch of truffles. After that, you’ll be guided through 7 delicious recipes that cut back a lot on fat, sugars, and calories, and you’ll learn how to make incredible truffles you won’t feel bad about enjoying. How Can a Chocolate Truffle Be Healthy? You’ve probably had a chocolate truffle in the past, and thinking back on it, you might be wondering how it could possibly be made in a healthy way! While it’s true that chocolate truffles are usually made with a lot of unhealthy ingredients, there are several ways you can improve a recipe to make it much better for you. If you’re looking at a list of ingredients or trying to choose a recipe for yourself, keep your eyes peeled for these key ingredients to show you that a truffle is healthy. Healthy chocolate truffles will be made from bittersweet chocolate or cocoa powder. If you see milk or white chocolate, and especially if you see CandiQuik or another type of melting chocolate, you’re probably not dealing with a healthy truffle. These products contain excess sugar and sometimes dairy products as well. A healthy truffle recipe will include coconut milk in place of dairy. This cuts back a lot on fat and sugar. Coconut milk is also very healthy and good for your digestive system, skin, and hair! To make healthy truffles, you probably won’t dip them in an outer shell. Some healthy recipes do include an outer shell, and it all depends on what you make the filling from. However, most truffles don’t use excess chocolate, so you’ll either have a chocolate filling or a chocolate coating, but not both. Healthy chocolate truffles use alternate forms of sugar. Dates are an excellent way to add some natural sweetness to your truffles without using real sugar, but there are other options as well. Maple syrup, honey, and coconut sugar have been used successfully in many truffle recipes. There are a lot of pros and cons when it comes to eating healthy truffles instead of normal, traditional ones. It’s a good idea to consider both sides before you choose whether or not eating healthy truffles is right for you. However, remember that making a decision based on your health is almost always a good call! Traditional truffles tend to have a better flavor and texture in many cases than healthy truffles. This is because they use more ingredients such as butter and white sugar that are commonly thought to taste better. Traditional truffles are often coated in melted chocolate that has then been hardened. This is also known as an American truffle. They may also be rolled in soft toppings like cocoa powder, but not always. Traditional truffles can be made with milk, white, or dark chocolate, or any combination of these. They may be filled with just about anything, from liquid to ganache to fudge-like chocolate. It’s hard to diet when eating traditional truffles. They tend to have a lot of calories and fat grams, and they aren’t usually made from very healthy ingredients. Traditional truffles contain a lot of sugar. If they’re coated in confectioner’s sugar or in a hard chocolate shell, they have even more than other versions. When you eat a traditional truffle, you’re getting a lot of fat, sugar, and other unwanted ingredients. Store-bought traditional truffles may also contain chemical preservatives that aren’t very good for your body. Think of eating a store-bought traditional truffle like eating a candy bar. You’re filling your body with ingredients that aren’t great choices! Of course, you don’t have to worry about this with a homemade recipe, but it’s still worth considering. Choosing a healthy chocolate truffle means you can cut down significantly on the amount of fat and calories you consume in your snack. Most healthy truffles fall below 100 calories and clock in at only a few grams of fat, depending on the ingredients used. They make for a great pick-me-up to nibble on when you’re sticking to a specific diet plan, or when you’re just trying to watch what you eat. You can also drastically decrease your sugar intake when you munch on healthy chocolate truffles in place of traditional ones. These truffles often use date sugar in place of white sugar, and they may also incorporate coconut sugar, depending on the recipe. Any of these options is much better for your overall, so if you’re watching your sugar, you’ll love healthy truffles. All of the ingredients utilized in healthy chocolate truffle recipes are chosen with your health in mind. They contribute to better weight loss, improved mental function, heart health, resistance to illness, and much more. Where a traditional truffle might use butter, a healthy truffle might instead incorporate coconut oil, which is an incredibly healthy ingredient. Eating healthy truffles isn’t all perfect. Unfortunately, a lot of healthy truffle recipes don’t taste as good as their less healthy counterparts. Since they don’t include a lot of full-fat ingredients or processed sugars, there is a little bit of flavor lost along the way. Healthy chocolate truffles are more likely to include allergens like nuts, fruits, and other potential hazards. If you’re allergic to a lot of foods, it’s a good idea to pay close attention to the ingredients in your healthy truffle recipes. Follow these simple tips and tricks to put together an amazing truffle recipe every time you step into the kitchen! Even when making healthy truffles, your chocolate makes a big difference. Use high-quality baking chocolate whenever possible, and be sure to go for at least 60% cocoa content. This chocolate is unsweetened and will be a lot better for you! Use coconut milk and coconut oil in place of dairy and butter whenever possible. This cuts back a lot on the fat and caloric content in your truffles. Instead of dipping chocolate truffles in more chocolate, roll them in Dutch-process unsweetened cocoa powder or in unsweetened coconut flakes instead. You can also roll your truffles in chopped nuts or almond meal to cut back on sugar even more. This simple, delicious healthy chocolate truffle recipe is a great place to get started if you’ve never made a healthy version of these popular sweets before. This recipe has some of the same ingredients as a less healthy truffle alternative, which makes it easy for anyone who’s ever made a traditional truffle to transition into creating these instead. However, a lot of ingredients have also been replaced with healthier alternatives! 1. In a small saucepan over low heat, melt heavy cream and coconut oil together and bring to a simmer. 2. Place chocolate chips in a large, heat-resistant bowl. 3. Pour hot cream mixture over chocolate chips and let stand for 5 minutes. 4. Whisk slowly to melt chocolate chips completely. 5. Add 2 to 3 drops of orange essential oil. 6. Cover loosely and chill in the refrigerator for 2 hours. 7. Scoop out 1-inch balls from truffle mixture and place on a lined baking sheet. 8. Place cocoa powder in a shallow bowl. 9. 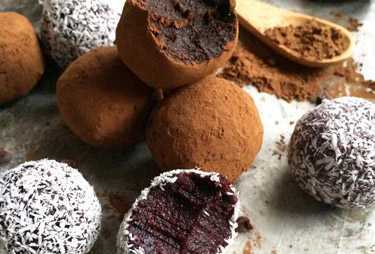 Roll truffle balls into cocoa powder to coat thoroughly, then return to baking sheet. 10. Serve at room temperature or store in the refrigerator. Cut back significantly on the amount of sugar you use in your truffles with this recipe for healthy chocolate truffles! This recipe utilizes the natural sweetness found in dates to create an incredible alternative to much less healthy candies. Best of all, each truffle comes in at around 90 calories and about three and a half grams of fat, meaning you can indulge in one at your next snack time without worry! 1. Soak dates for 10 minutes in warm water, then drain and squeeze excess water out of each date. 2. Place pecans in a food processor or blender along with the almond meal and cocoa. Pulse until ground finely. 3. Add dates, salt, and vanilla, and pulse until mixture becomes sticky and forms a ball. 4. Roll into 1-inch balls and place on a lined baking sheet. 5. Place unsweetened coconut in a shallow bowl. 6. Roll balls into shredded coconut to coat thoroughly. 7. Return to baking sheet and chill in the freezer for 1 hour. 8. Serve cold or store in the refrigerator. If you’re one of the many people sticking to a gluten-free diet, you’re probably wondering how you can make truffles without worrying whether or not you’re eating something you shouldn’t. With this healthy chocolate truffles recipe in your repertoire, you’ll be able to quickly put together some of the most delicious healthy truffles you’ve ever tried, all within a very short amount of time! 1. In a large bowl, combine cocoa powder with oat flour, honey, and peanut butter. 2. Stir mixture until a dough is formed. 3. Roll mixture into 12 balls and place on a lined baking sheet. 4. Roll balls in chocolate chips and return to lined baking sheet. 5. Let stand in the refrigerator for about 10 minutes. 6. Serve at room temperature or store in the refrigerator. There are plenty of ways to make excellent vegan truffles, but with this recipe for healthy chocolate truffle balls, you’ll never need to go looking for another method! This is a simple and delicious recipe that includes tons of healthy ingredients that are sure to make a difference in your snack time. Try it with lots of different toppings to create unique, delicious truffles every time. 1. In a large blender or food processor, add dates, almond flour, flaxseed meal, cacao powder, chia seeds, agave syrup, and almond milk. 2. Pulse on high until the dough comes together, then place in a small bowl. 3. Roll dough into 1-inch balls. 4. Place chia seeds or other toppings in a small bowl. 5. Roll balls into chia seeds and place on a lined baking sheet. 6. Let stand at room temperature for 10 minutes. 7. Serve at room temperature or store in an airtight container. Do you want to indulge your taste buds in luscious dark chocolate truffles? Look no further than this healthy dark chocolate truffle recipe! This is an incredible recipe that uses a lot of different flavors to combine and create the perfect taste and texture every time you bite into one of the truffles you create. You’ll want to share this recipe with everyone you know, and serve it at every party, too! Give these truffles as holiday gifts and no one will ever know they’re healthy. 1. In a large microwave-safe bowl, combine chocolate chips with vanilla, coconut milk, and cinnamon. 2. Heat in the microwave for 30 seconds, then stir. Repeat this process every 30 seconds until chocolate has melted and the mixture is smooth. 3. Cover tightly and chill in the refrigerator for 3 hours. 4. Remove and scoop out 1 tbsp sized balls. Place balls on a lined baking sheet. 5. Spread hazelnuts onto a skillet and toast for 3 minutes, stirring often to keep from burning. 6. Place toasted hazelnuts in the food processor and pulse a few times to chop. 7. Pour hazelnuts into a small bowl. 8. Roll 1/3 of the truffle balls in hazelnuts to coat. 9. Roll others in coconut flakes and cocoa powder. This excellent recipe for almond truffles is sure to surprise and delight all of your friends and family when you make it for your next holiday party! There’s something really special about the taste of dark chocolate and almonds combined, and you’re sure to discover just how great it can be when you give this delicious recipe a try. Put it together in only a couple of hours total and it’ll soon become your new favorite truffle recipe! 1. Soak dates in warm water for 10 minutes to soften. Remove pits if dates are not pitted already. 2. Place dates in the blender or food processor along with cocoa powder, vanilla, sunflower seeds, almonds, and salt. 3. Pulse on high until moist and doughy. If the mixture is not getting moistened enough, add more soaked dates. 4. Scoop dough into 1 tbsp balls and place on a lined baking sheet. 5. Let balls stand at room temperature while melting chocolate. 6. Set up a double boiler on the stove. 7. Place chocolate in the bowl of the double boiler and stir, cooking gently until melted. 8. Using a fork, dip balls into melted chocolate and tap to remove excess. 9. Return balls to lined baking sheet. 10. Chill in refrigerator for 45 minutes. 11. Serve cold and keep stored in the refrigerator. Truffles are easy to alter to fit just about any type of diet, and the paleo diet is no different. These delicious paleo chocolate truffles can be made with just a few simple ingredients, and enjoyed as a part of a healthy paleo diet at any time! This recipe is designed to taste great and mimic the texture of a traditional French truffle. When you bite into one of these truffles, you won’t be able to tell the difference! 1. Heat coconut milk in a small saucepan over low heat along with chocolate. 2. Stir to melt slightly. 3. Add maple syrup and espresso powder. 4. Cook and stir until melted completely and slightly gooey. 5. Remove from heat and add sea salt. 6. Add lavender oil if using. 8. Chill in the freezer for 2 hours to harden. 9. Let soften for about 5 minutes at room temperature, then scoop into ½-inch balls. 10. Place on a lined baking sheet and chill in the refrigerator for 30 minutes. 11. Roll balls into cocoa powder. 12. Serve at room temperature or store in the refrigerator. Have you picked your favorite truffle recipe? There are tons to choose from, and we’ve only scratched the surface of healthy truffle recipes! No matter what you’re looking for—whether you hope to cut back on sugar intake, reduce the amount of fat and calories you eat in a day or stick to a diet regime such as veganism or paleo—you can find the perfect truffle recipe to help you snack in a much healthier way than ever before. But which one of these recipes is the best? It depends entirely on what you’re looking for, but my personal favorite is the Almond Truffles recipe. This cuts back on sugar significantly while still adding enough flavors that you’ll never notice you’re eating something healthy. Although it includes a lot of ingredients, they’re all pretty easy to find at your local market, and shouldn’t cost you too much to gather. My other top choice from these healthy recipes is the Paleo Truffles option. This is a unique and delicious recipe that gives you a hint of coffee flavor to help round out the taste. You’ve probably never had a truffle quite like this one before, and you’ll fall in love the first time you take a bite! Like my other truffle recipe recommendation, this one doesn’t have too many complicated ingredients, and you should be able to make it for a reasonable price. No matter what you’re looking for, there’s a great healthy chocolate truffle recipe out there for you. Try these out on your friends and family, and be sure to give them away as gifts, too. No one will even notice you’re giving out healthy candy, and you’ll be pleased with the results of your delicious gift-giving! Of course, you can also keep them all to yourself, and you’ll be tempted to when you see what an incredible healthy truffle you can make with almost no effort.